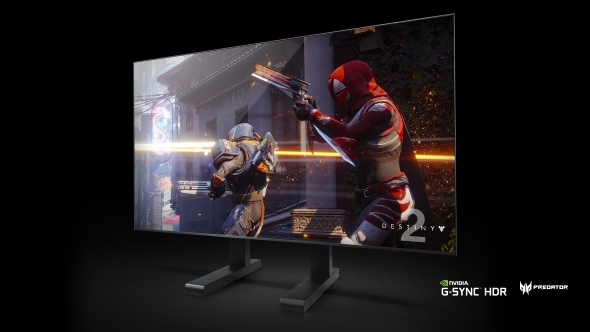 At CES last week, Nvidia unveiled their vision for a range of enormous, retina-searing G-Sync HDR gaming screens, the Doom-ily named Big Format Gaming Display. I had a chance to get a look at the three BFGDs on show and sincerely hope the final screens have better panels than the pre-production prototypes are running right now. You will definitely need one of the best graphics cards around to be able to power such a big fragging gaming display. Don’t get me wrong, the new BFGDs are striking bits of extremely large tech. 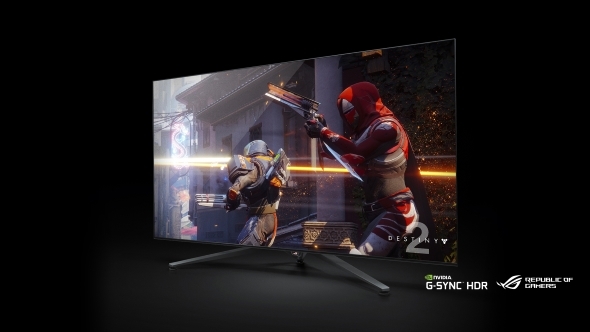 The imposing 65-inches of 4K G-Sync HDR gaming panel is desk, vision, and room-filling thanks to its sheer size, the distance PC gamers sit to their screens, and the 1,000nits of peak luminance the displays offer. There are three BFGDs lining up for a summer launch from HP, Asus, and Acer. All three are using the exact same 65-inch AU Optronics VA panel and have a 120Hz base refresh rate, G-Sync HDR support, a 4K native resolution, and a Nvidia Shield Android TV box built into them. The Shield hardware is now capable of driving G-Sync for streamed content being shown on the screen whether the client PC has a G-Sync screen connected to it or not. 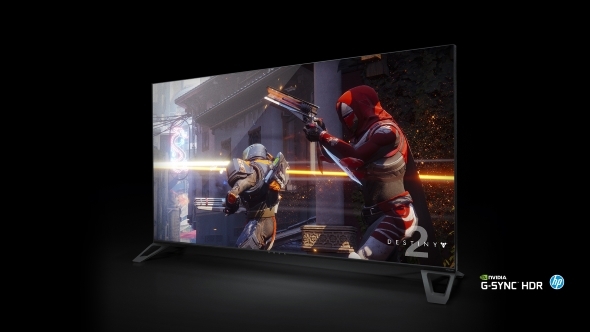 The Big Format Gaming Displays also have an ultra-low latency design, delivering the low response time gamers are looking for in their screens – one of the main reasons why traditional TVs lacking such support haven’t been that great for PC gaming. “What’s going to differentiate the three,” Cleveland explains, “is the industrial design of the case, the stands, any audio they integrate into the display, the OSD options. Asus like to put gamer options, like the crosshair, and Asus also like to add overclocking features too, so they may do that. In terms of their HDR support we’re talking HDR 10, which is the essential standard HDR PC gaming, and the wider HDR ecosystem, seems to have adopted. The AUO panels are also using the same quantum dot technology Samsung have been using in their QLED displays. The quantum dot filter has these tiny 5 / 6nm dots on it which focus the LEDs to narrow the bandwidth so the display is able to reproduce a wider range of colours, something that is vital for high dynamic range content. For the most part, they really do look like rather incredible screens when Destiny 2 is being writ large at a silky 4K resolution with G-Sync HDR smoothing out the rough edges and brightening up the game world. All the three screens seem bright and colourful, and there doesn’t appear to be any latency or movement ghosting issues either. The big problem with the pre-production panels Nvidia, Asus, Acer, and HP were all showing off at the show, however, was the dramatic halo effect that becomes apparent as soon as you display any bright detail on a contrasting dark background. That’s a symptom of the level of local dimming the panel makers are including with this display. 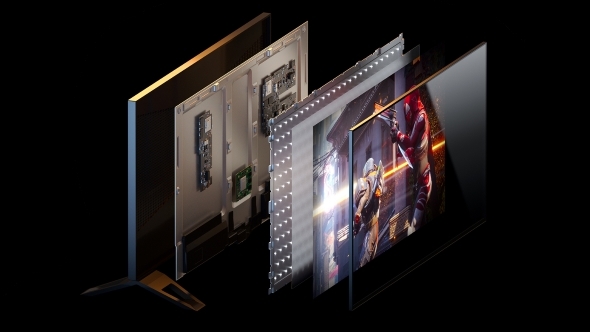 Nvidia wouldn’t go into the full specs of the AU Optronics screen and refused to divulge the number of dimming zones being used in the direct-array backlighting of the BFGDs. Fingers crossed, then, that they really are just early samples and not 100% indicative of the final panel quality that we’re going to see when the BFGDs are released in summer. That halo effect really is quite distracting and could be quite damaging to the HDR experience in moodier games which aren’t so brightly lit as the Destiny 2 scenes currently being used to demo them. A full-array backlighting system would have a huge number of LEDs behind the display, offering a more finegrain approach to darkening the rest of a scene when there are highly contrasting areas of dark and light. This direct-array layout uses fewer LEDs – and is therefore cheaper – but increases the depth of the monitor chassis and stops the local dimming from being as accurate. Obviously, the ideal would be a 65-inch, 120Hz, G-Sync-capable OLED display. I’d happily forgo the 1,000nits peak luminance for the slimline, self-emissive tech that means individual pixels can be shut down to display complete black. Mmmm, OLED. And considering you’re surely going to be paying somewhere around the $2,000 for one of these 65-inch BFGDs, you could get yourself a lovely 55-inch OLED for the same price, or maybe even cheaper. Though you’d be missing out on the Shield and ultra-low latency stuff. The other hang up I have with the Big Format Gaming Displays is that size. These can’t realistically be used by most gamers, even if they could afford one. They obviously won’t fit on most desks… they won’t even fit in most living rooms. It might sound apocryphal but size does matter, and 65-inches is too big for a TV, let alone a PC monitor. When that thing’s off it just becomes an enormous, oppressive black mirror. Thankfully, as 55-inch is another fairly standard TV size, manufacturing a smaller version of the same panel should be relatively simple, making a tiered range of Big Format Gaming Displays very much a possibility in the future. And don’t forget that we’re soon going to be getting the long-promised G-Sync HDR monitors that were shown at CES last year, as Nvidia have confirmed that the 27-inch version is launching in the spring.